Paul Martino is a co-founder and GP of Bullpen Capital, an early-stage VC firm. Editor’s note: Paul Martino is a co-founder and GP of Bullpen Capital, an early-stage VC firm. He is formerly the founder and CEO of Aggregate Knowledge. The seed “round” as a singular event appears to be dying. What used to be a discrete funding round is now more of a rolling, continuous financing process. Manu Kumar at K9 ventures wrote a great post this month in which he points out that these days “the Series A is now the fourth round of funding in a company,” after friends and family ($50K), pre-seed (~$500K), and seed (~$2 million). 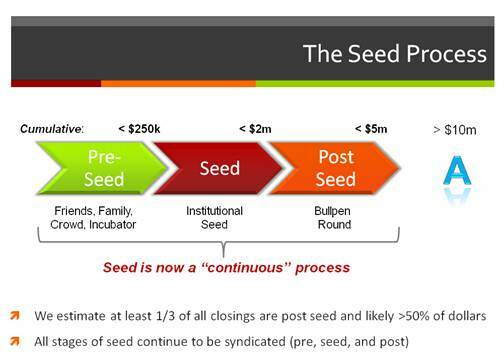 At Bullpen we say “seed is a process,” and it’s important for entrepreneurs to know how to tailor this process to minimize dilution and maximize survival chances. The fundamental change in the seed financing process was caused by two things: the lean startup approach, which drove early-stage financing documents to be as lean as the companies using them, and the consolidation of traditional venture funds, which drove them to larger, later rounds and opened up room for more diversity at the early stages. In the pre-Internet days, the venture community only seemed to invest in 10 or 20 predictable deal types, infrequently betting on consumer behavioral change. Now, in the world of low initial startup costs and rapid product iteration, entrepreneurs can throw many crazy new ideas at the market to see what sticks, and then focus their full efforts on the winning ideas. The early seed process is, in essence, all about maximizing options and keeping the company agile by taking capital in the right amounts at the right times. The more pragmatic part of the explanation is that it obviously makes no sense to pay lawyers $25K to complete a $50K financing round. Therefore the structure of early stage of financings had to become as lean as the company’s initial go-to-market strategy. The solution was the now ubiquitous “capped convertible note,” which enables founders to accumulate money from various investors over time and then convert those investors’ holdings into equity shares down the road. Prior to the capped convert, founders had to raise a discrete seed or Series A round, which was expensive, slow and cumbersome – unsuitable at a time when “lean” startup methodologies are now the norm. By contrast, the capped convert is lean and fast and allows the founder to stack up notes, even to collect different prices for different caps. Part of the reason the capped convertible note has become so popular is that it was the standard structure adopted by Y Combinator. The specific flavor of note from Y Combinator has been copied and reused by others under the heading of “the YC note.” Since innovation doesn’t occur in a vacuum, Series Seed documents were created and shared with an open-source attitude so that much of the time and cost associated with the “old style” Series A could be eliminated. This new process of financing can have significant advantages for the founder CEO. In many ways the biggest benefit can be summed up in a statement I recall Keith Rabois making at a board meeting a while back. This is not a direct quote, but pretty close: “The weapon that the startup CEO has to counter the VC process is WHEN he or she raises.” This comment was made many years ago during the discrete finance era. But now with the continuous process, the CEO can wield this weapon more frequently and preserve significant ownership for the founding team. Here’s why. Each time the company hits a significant milestone, the CEO can increase the cap on successive convertible notes, making later tranches of money less dilutive. Companies that are on a quick upward trajectory can play this game very successfully over a period of 6 – 18 months. We have seen many companies that have done 3 or 4 separate convertible notes over the period of the first year or so of the life of the company. We are investors in one YC company that has done 6 or 7 at this point. With each new note the CEO (or 3rd party) can increase the value appropriately because the deal becomes less and less risky for investors. Another major benefit to this process (beyond preserving ownership) is the ability for the founders to continue to select value-added investors. If the process is rolling and you can’t get in front of one of the people you want in time for the first close, no problem! You will probably do another close in another 90 days. One caution we give entrepreneurs when discussing rolling closes (the continuous process), however, is that they “optimize for success.” When your metrics are “up-and-to-the-right,” all is well. When you stub your toe, all of a sudden no one is interested in adding onto the note and you are left with a very short runway to hit the next big milestone. In addition, convertible notes constitute debt and not equity, and debt is much less forgiving if you encounter a downside situation before it converts into equity. While strategizing a financing plan, we generally encourage entrepreneurs to build a large enough syndicate, or a syndicate with a deep enough pocket or two to get the company through any setbacks. There is a certain irony to this milestone-based fundraising process. Big bad old-school venture capital firms used to use the “tranche” mechanism against you, offering some money now and some later only when you hit specific key milestones that they defined. If those conditions weren’t met, the entrepreneur was often at the mercy of the VC who held the option to trade the deal price down. The power dynamic today, however, has shifted significantly in favor of the founders. There are 150 or so institutional seed funds out there to choose from now, and you can control when and how much you raise – timing capital intake with key milestones to maximize success. One final comment: We have been searching for data sets to validate this overall thesis, but in general the data sources are only tracking discrete financing events. The public frequently only sees the big financing round (or even the increasingly common “Supersized-A” round), and doesn’t get visibility into the rolling notes underneath the surface that carried the company along the way. We think this has the potential to be very misleading to both investors and entrepreneurs, so we’re very open to collaborating to bring some transparency to this process. Whether third parties are interested in collecting the right data, or founders and investors are willing to discuss informally/anecdotally about what they’re seeing in their own experiences, we’d be happy to get in touch.